The kitchen is the heart of the home. It's where you come together with family and friends to prepare meals (and in many cases eat them too), entertain, and hang out. Which brings us to the layout. When the goal is to maximize flexibility and functionality, the L-shape is the way to go. This ever-popular design works in an open floor plan and also lends itself to small-space living. We've gathered a collection of 12 modern and versatile L-shaped kitchens to inspire the most important room in the house. 1. Infuse a homey, farmhouse feel. Dreaming of a country kitchen? 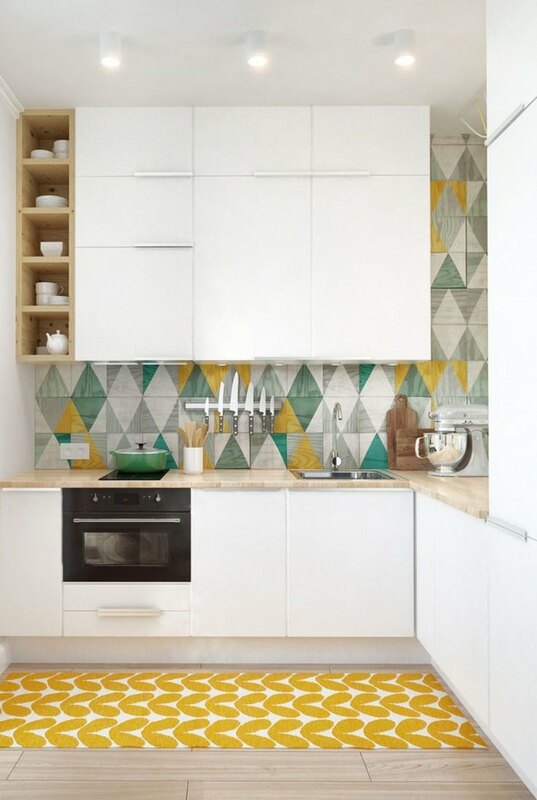 Pair white cabinets with a patterned tile backsplash and earthy wood accents to create a modern rustic vibe. Add a couple candelabra-style pendants to infuse a little extra charm. This Moscow apartment is clean and contemporary with a major dose of color! 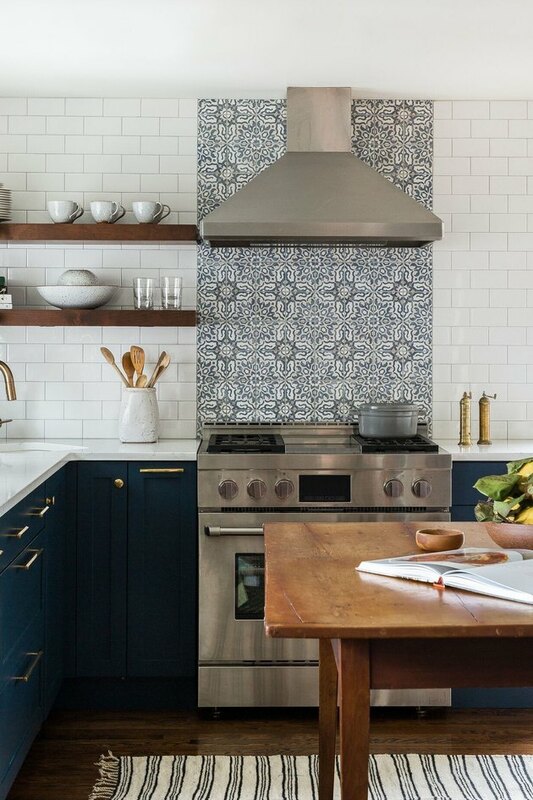 A vibrant tile backsplash and cheerful accents, like a sunny area rug, really brighten it up. 3. Say "yes" to sea foam green. There's no shortage of coastal charm in this seafoam stunner. Mark Williams Design Associates employs stainless steel and lots of white to create a chic and balanced aesthetic. 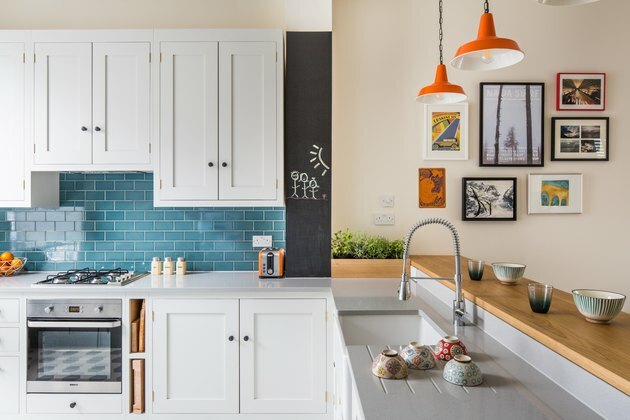 This quirky, retro-style kitchen flaunts oak shaker cabinets, turquoise tiles, and orange pendant lights. A painted chalkboard and framed artwork round out the playful vibe. 5. Marry modern and industrial. 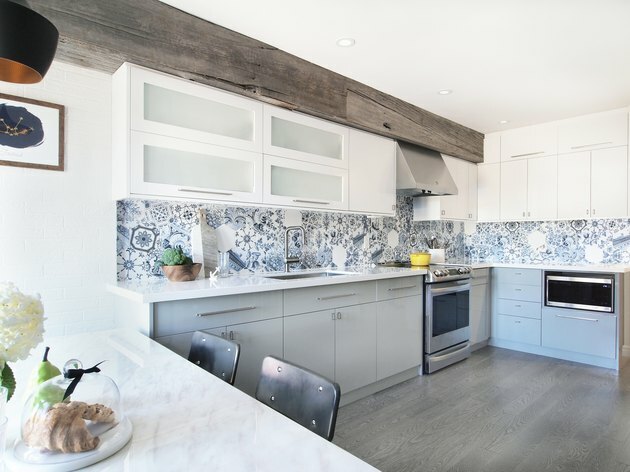 An alchemy of modern and industrial style, this kitchen touts white-washed brick walls, an exposed wood beam, Lisboa patchwork hexatile, and frosted-glass horizontal upper cabinets. There are so many beautiful design ingredients that went into making this Beacon Hill abode. 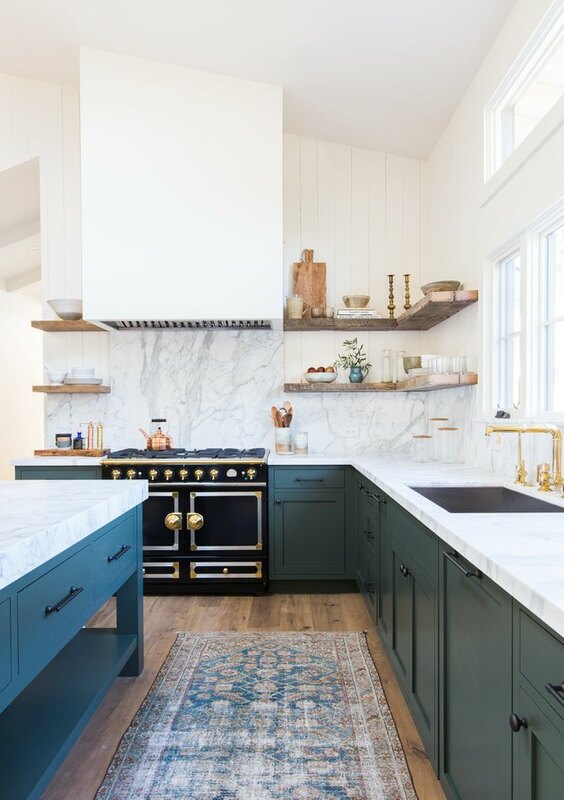 We love the way Heidi Caillier blends rich-blue cabinets, patterned tile, and rustic wood elements into a kitchen that epitomizes eclectic-farmhouse. A cool gray and white color palette, and lots of natural light make this traditional L-shaped kitchen feel au currant. And the center island — with hidden compartments to store cookbooks and the like — is beyond clever! 8. Give black and white a try. 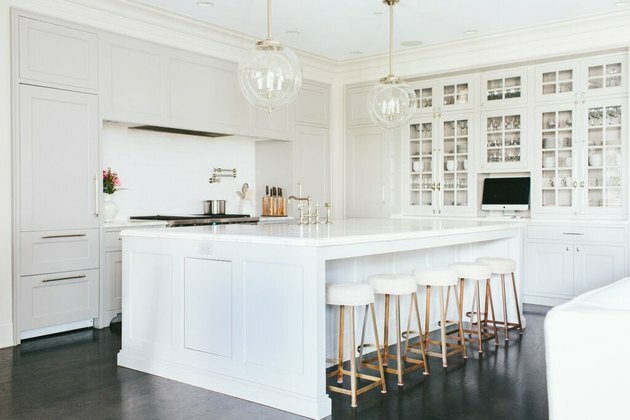 This sleek black and white kitchen is a lesson in the right way to execute this popular trend. 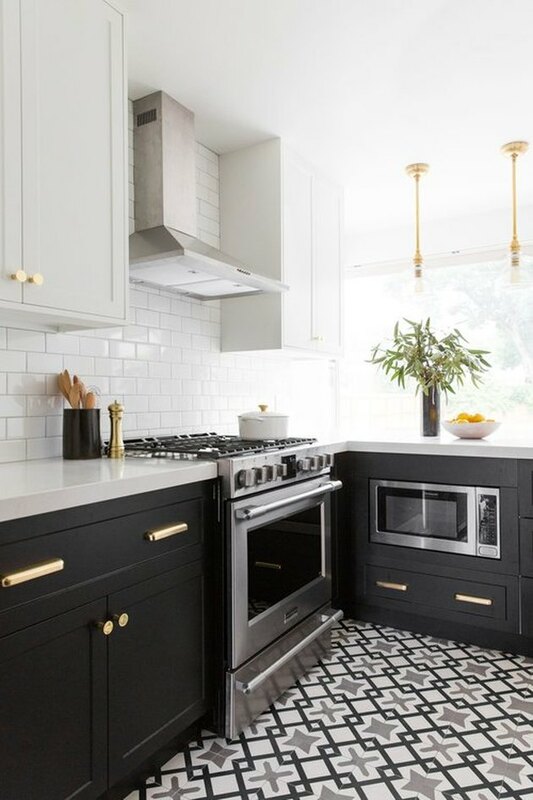 Featuring all of the essentials and complemented by brass hardware and white subway tile, the black cabinetry really stands out. 9. Channel year-round summer style. This light and airy ambiance screams upscale beach house. 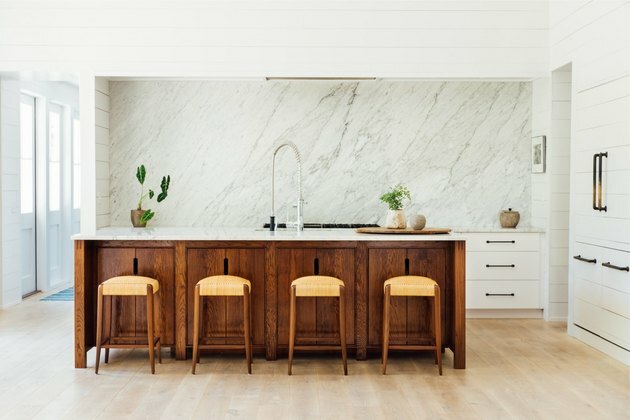 The counter seating at the kitchen island is a laid-back alternative to a formal dining room, and takes advantage of the enviable natural light pouring in. 10. Create a casual dining area. 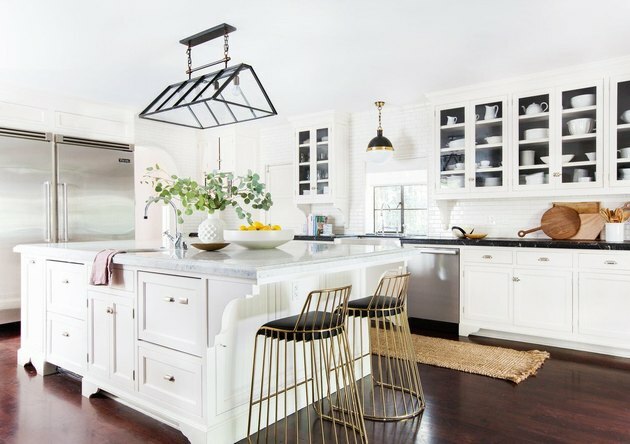 This swanky kitchen is redefining the phrase "casual dining area" with these gorgeous gold counter stools, and we are taking notes. 11. Mix old and new. Rustic meets refined in this Leaside, Toronto kitchen. 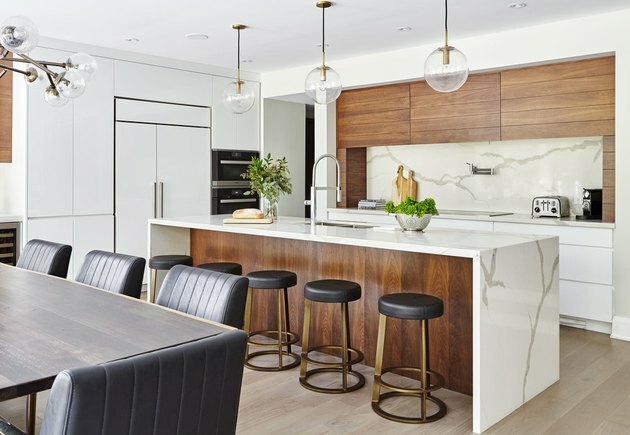 The warm wood paneling beautifully contrasts with the stunning white marble, all complemented by striking, glass ceiling lighting above the dining table and kitchen island. 12. Inspire calm and tranquility. 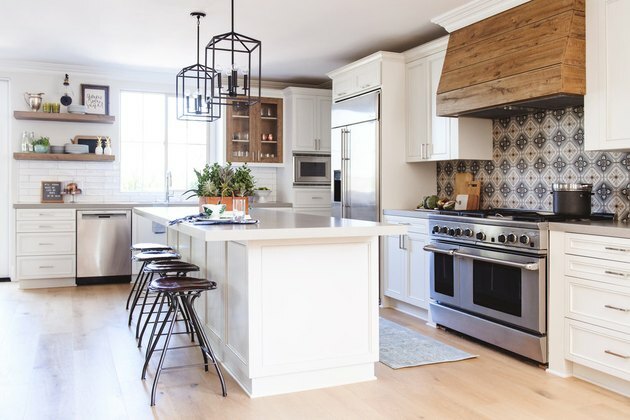 This kitchen is proof that California cool never goes out of style. The eye-catching marble backsplash and bold colored cabinets work together to give this kitchen its undeniable wow factor.